The batteries that power our smartphones, tablets and other similar electronics are a crucial factor that affects how we use them on a daily basis. Despite advances in their technology, they may still discharge at a faster rate than we might like, and interrupt our screen-time when it’s time to recharge them. A longer battery life may mean a larger, more bulky battery which, unfortunately, is out of step with the perceived preference for more streamlined and thinner devices. Modern-day power packs are also not completely safe – defects in their casings or mountings within devices can increase the risk of catastrophic failures and fire hazards. This is well illustrated in the case of the unfortunate discontinuation of Samsung’s Galaxy Note 7 product line shortly after its 2016 release. Monolithic, rigid batteries are also a problem for companies that may want to offer more ergonomic, flexible wearable-tech, or those who want to advance the option of curved interfaces as a USP. Therefore, if battery technology is to remain productive and relevant, it may have to find new form-factors and electrochemical structures. Battery technology that comes in the form of fabric- or tape-like materials, can be cut or shaped to fit a design and can be recharged are an emerging trend in electronics. We’ll take a look at one form of this new generation of portable power solutions in this article. Batteries are essentially a mixture of one material, usually a pure element, which donates negative ions, and another material that provides positive ions. Both types of materials are known as electrolytes, and the flow of electrons from one to another results in the generation of power. This simple concept has developed into complex, multi-cell power packs that can supply electricity at rates usually measured in milliampere-hours, or mAh. Modern-day smartphone batteries have capacities of about 1000 to 5000mAh. These batteries are also rechargeable, using standard power-delivery systems such as USB, which enables the continual, if not exactly uninterrupted, use of the devices they power. These batteries do have some disadvantages, however. The high-tech electrolytes are often toxic or dangerous in other ways, which calls for durable, heavy-duty casings and electronic connections to protect a device, and the rest of the general, external environment, from their leakage. This necessity often means that device design has to work around the dimensions of the battery and its protective casing. Therefore, aesthetics may be curbed in favour of greater ergonomics and functionality that works around the battery’s rather uniform size and shape. Lithium is probably the best-known electrolyte used in rechargeable batteries. However, the use of this element has a number of disadvantages that call its near ubiquity in electronic power into question. It is surprisingly expensive to source and process and requires the addition of other materials, including organic electrolytes and graphite, which are fire hazards. Therefore, the use of lithium-ion power can greatly increase the costs and resources involved in conventional battery production. These drawbacks may hold back the consumer electronics field over time, especially if it wants to exploit the potential of devices worn on the body. These wearables may need to conform to the contours of the wearer’s body, and this is interrupted by heavy, rigid battery packs. So how can batteries cater to such aspirations whilst also being less susceptible to damage? For a start, the batteries will need to be much thinner, perhaps in strips that can form one layer of a new-generation wearable, and also be able to bend. This adaptation sounds unlikely, but actually has been implemented by a number of research groups. Their prototype batteries incorporate electrolyte compounds into flexible polymer ‘beds’ or binders, so that the entire arrangement can carry and store charge even if they have been bent or twisted. A recent example of this flexi-battery technology is one that uses a binder made of molecular chains that alternate polystyrene with polyisoprene, a component of rubber. This polymer, developed as part of a project completed at the University of California San Diego (UCSD) by Professor Joseph Wang and his nano-engineering team, makes the battery not only flexible but stretchy as well! These new batteries may also replace lithium with zinc and silver as electrolytes. Zinc anodes were components in the original batteries devised by Alessandro Volta, and can produce appreciable battery life by extending an average cycle, when combined with bismuth tetroxide or carbon to enhance conduction. Adding bismuth tetroxide also ensures that the zinc-anode battery is rechargeable. In its current form, one square centimetre of this battery has a capacity of approximately 2.5mAh. This may seem disappointing – it equates to a practical operational capacity that is one-fifths that of the battery found in a hearing aid – but improving the scale by increasing the surface area of this concept should be easy and effective. 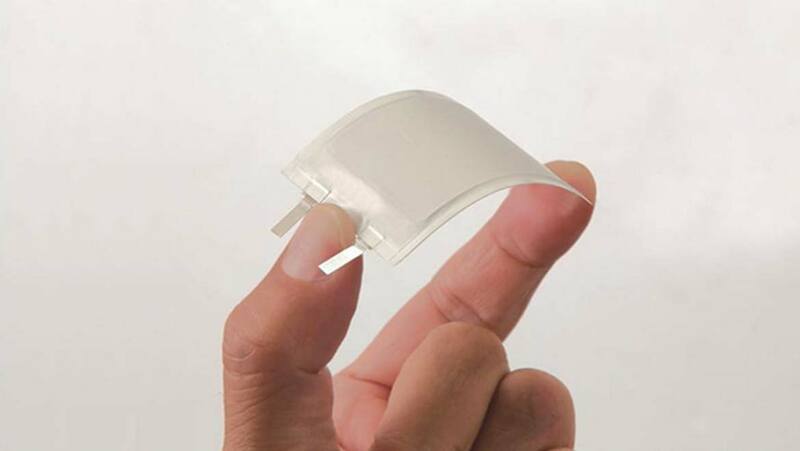 The concept of a stretchable battery is, again, not entirely new. It may be the most recent, however: a paper describing the prototype was published in the April 2017 edition of the journal Advanced Energy Materials. Its authors claim that their creation has the highest discharging density and recharging capacity compared to other known stretchable battery types. The team at UCSD also claim another crucial advantage for their new bendy battery: its cost-effectiveness. The complete polymer can take the form of an ink. Therefore, the researchers print it onto a surface for as little as a tenth of the cost of a comparable conventional battery. New-generation batteries may move away from lithium-ion technology towards new electrolyte conformations that may take up less space. There is also increasing demand for batteries that are compatible with wearable devices that may be placed directly onto the skin for health-tracking and other similar applications. The prototype developed by Professor Wang and his team at UCSD can also be printed onto surfaces; in addition, their stretchy qualities mean they are durable and resilient enough to be printed on clothing and other materials that are likely to see a lot of mechanical stress. This implies a whole new field of potential in ‘smart’ garments, wearable-tech and novel power-delivery systems. In fact, Wang has now secured funding to investigate the next steps his team’s breakthrough could take to be integrated into next-generation devices, such as health sensors. This could lead to opportunities for consumers to buy their own self-powered shirt in the near future and never worry about their phone going flat ever again. Shin J, You J-M, Lee JZ, Kumar R, Yin L, Wang J, et al. Deposition of ZnO on bismuth species towards a rechargeable Zn-based aqueous battery. Physical Chemistry Chemical Physics. 2016;18(38):26376-82. Kumar R, Shin J, Yin L, You J-M, Meng YS, Wang J. All-Printed, Stretchable Zn-Ag2O Rechargeable Battery via Hyperelastic Binder for Self-Powering Wearable Electronics. Advanced Energy Materials. 2017;7(8):n/a-n/a.